It's a terrifying feeling to realize that your dog may have ran away and gotten lost, or worse – was stolen. Ideally, you've listened to the advice of animal safety professionals like those we've interviewed on the podcast before, and microchipped your pet, placed an ID tag on the dog's collar and maybe even used a GPS collar or tracker. If not, here are some more tips on how to find a missing dog and what to do right away. The obvious action on how to find a missing dog first – if you took precautionary measures and purchased a dog GPS collar or a simple GPS tag locator for your pet, the very first thing you should do is check to see your dog’s location. Some simple activity trackers might even have a GPS locator that you didn't know so check if yours might have had that option. These nifty safety accessories often cost a monthly subscription in addition to the initial price of the device but can accurately tell you not only where your pooch has run off to but also keep track of their activity by monitoring their heart rate. However, not every pet owner has these helpful commodities, in which case, extra steps need to be taken. No matter the circumstances, the first thing many people will do when finding a lost dog is check pet's collar for tags and check the tags for information on how to contact an owner. Many dog ID tags give the opportunity to list more than one phone number, which can increase your chances of connecting with a kind citizen who has found your pet. When you put an ID tag on your pooch, you may also want to list your cell phone and land line, or your number as well as a family-member’s. When your dog is missing, be sure your phone is always on ringer, that way you get the phone call as soon as any new developments occur. Revisit the area where your pet escaped. A little detective work of your own can go a long way in how to find a missing dog. Ask neighbors if they heard or saw anything. Nearby loud construction or fireworks during the summer time could cause a terrified animal to escape your home. Did your dog happen to leave anything behind? It may sound silly, but try to think like Sherlock Holmes – any information you discover will define the next steps you need to take. For example, perhaps when your pup dug and squeezed themselves under the backyard fence, their collar snapped off. In this case, you’ll at least know that no one will be able to contact you. You can also deduce that anyone who happens to see your dog without a collar will assume it is a stray and potentially call animal control, which would lead you to the next step you should take: calling local shelters. The crucial step in how to find a missing dog is to contact organizations that deal with this on a daily basis. Most people who see a dog running lose will call animal control and when the dog doesn’t have any form of identification (microchip or tags), then they’re likely to be taken to the local animal shelter. Call all animal shelters that are closest in proximity to where your dog became lost and explain the situation. They’re likely to ask if the dog has identification; if not, they’ll ask for a few descriptors of your animal. Helpful characteristics include the dog’s age, general size and weight, hair color and length, as well as any unique traits, such as odd coat markings or scars. You may even request to email the shelter a photo of your dog, which they can then forward to others. No matter where you live, neighbors are a powerful resource in potentially helping you find your lost companion and even give you more helpful tips and information on how to find a missing dog. In a rural area, where your neighbors aren’t easily available right next door, you can post missing dog flyer (see our two missing dog flyer samples below) at a heavily-trafficked businesses, such as the favorite local eatery, post office, or grocery store. Many of these commercial buildings will have a community board you are free to use, but if not, you can politely ask the staff if you can utilize their window space. Simple missing dog flyer sample. Open it in any picture editor, and paint over the current markings with white and then replace with your details. Add your missing dog's photo over the place-holder. Detailed missing dog flyer sample. This one is easier to simply print out and fill out by hand and place your missing dog's photo then scan the sample for multiple prints or Xerox it. Use a simple missing dog flyer to post around the neighborhood, and use a more detail flyer to post in very specific places or give out to your friends and neighbors, or to some locations like post office and stores where you think your missing dog might end up. If your dog is friendly and trusting of strangers, you can even leave a small bag of their favorite treats with your neighbors and request their help in baiting the dog if they happen to see your pet in the region. Leave your cell phone number with them, as well, just in case they successfully locate your pet. Of course, should knocking door-to-door or making and printing out missing dog flyer require too much of your time during a busy workweek, there’s another wonderful resource available to us on how to find a missing dog: the Internet. Perhaps the most efficient way to get the word spread about a missing animal is social media, and there's been tons of cases where social media was crucial in how to find a missing dog. Other websites can also be very helpful, so do some research online. Before you go through social media, you can also visit sites like Pet FBI that are designed specifically to help with how to find a missing dog and reunite owners with lost pets. Sites like Facebook have become popular for more than just keeping in touch with old school friends. Nowadays, the site even has a “Marketplace” tab where anyone can post items for sale. The “Share” button will help your online friends share the post with their friends and on and on, creating a domino effect, making it possible for thousands of people to see it within a short amount of time. There are even whole groups dedicated to sharing photos of lost dogs in the hopes of finding their owners. You can find these through a general Google search or even searching through Facebook itself. Keep the text of the post short and sweet. The average online user may become easily discouraged to read a lengthy post and scroll right past it. What you absolutely should include: the dog’s name, a short description of their appearance and temperament, and when and where they went missing. Consider the photo of your dog. You should use a recent photograph of your dog. While their picture as a puppy is adorable, it won’t be an accurate representation of their current appearance and online viewers are most likely to remember the photo, not the written description accompanying it. Also take into account the coloring of the photo: odd lighting can make colors distorted, giving brown fur a black color or red fur a blonde hue. Try to include two photos if you can, one of their face as well as a full-body one to give an idea of their size. Don't add more than four pics. Make the post public. In order to make sure your post is shareable, it should be adjusted as a “Public” post. This is selected by clicking on the small icon directly under your name that looks like the silhouette of two people. Click this icon and select “Public” which will have a small icon depicting Earth. Making the post public will give you better outreach and improves your chances of reuniting with your missing dog. Don’t include your personal information. Since this post will be viewable by anyone on the Internet, you may want to be cautious about including your phone number. Instead, request that Facebook users send you a message. This will keep you safe from scammers and prank phone calls. Regularly check your Facebook messages. If someone you aren’t friends with on Facebook sees your post and has valuable information, they will attempt to message you. However, if you aren’t friends, their message will go into your inbox as a “Message Request” without any notification to you. At the top of your message inbox are two tabs, one says “Recent” and the other says “Message Requests” which is where you will find messages from anyone you are not friends with. You can then decide to accept or decline these communication requests. These social media lessons might seem obvious or unnecessary to some, but when it comes to how to find a missing dog, any little helps in increasing your chances of reunion. There are numerous reasons as to why our faithful hounds may run away, but sometimes it doesn’t take too much guess work. Dogs, like us, may have a favorite “hang out”. Maybe it’s the dog park you frequent together on the weekends or maybe it’s a house a few blocks away that has a doggy playmate they’re anxious to visit. Either way, one of your pet's favorite spots could be the destination they’ve escaped to find. If you have no other means to locate your missing dog, one of the first things you can do is look for them, starting with their favorite places and doing more Sherlock Holmes-like detective work. Sadly, some dogs go missing because they’re stolen right from their backyard. The biggest motivation to these crimes is often profit-related. Regularly check online marketplaces, such as Craigslist, as thieves may utilize these sites. In many countries, dog stealing is actually on the rise right now. In cities where this is particularly common, search queries for how to find a missing dog are increasing as well. “Dog-flippers” will often attempt to cover their tracks by dyeing a dog’s hair a different color, so if you have suspicion that photos of a dog online look strikingly like your furry friend, follow through by posing as a buyer. If your lost pet is microchipped, you can bring along a microchip reader to confirm if it is your dog or not. Universal microchip readers can be pricey, but often microchips will come with their own specific reader that you can use. If your dog is a rescue, often you can coordinate with the animal shelter and request their help by accompanying you to meet with the thief/seller. If you have reasons to believe your pet has been stolen, you can file a report with the police. This will be especially beneficial to you if you do find your previously lost dog online for sale. Remember: pets are considered valuable property which means by criminal law theft is a misdemeanor, in some cases, a felony. Always microchip your dog and use ID tags. Then, remember to update your dog’s collar and microchip information every time any of your contact information changes. Most microchip’s information can be updated online in a matter of minutes and purchasing a new tag is just as simple when you visit your nearest pet supply store or adoption center. If your dog is frequently getting out of the house or yard, revisit the area they are escaping from. Routine maintenance, such as replacing rotting wood, can better ensure your dog is secure. Communicate with others in your household, if any, about the importance of keeping doors and windows closed. 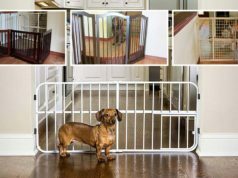 Some owners are against it, but others may utilize an invisible dog fence to prevent dogs being easily distracted by other animals and running away from the backyard, then getting lost. If your dog is frequently getting lose, it could be that they're extremely bored and lonely while you’re not home. It may sound simple but purchasing some time-consuming chew toys, particularly interactive dog toys or other mechanisms designed with dogs in mind could lessen their desire to run away. There are a number of brands that cater to a dog’s want to not only chew but to also problem-solve. These interactive dog toys are like puzzles and may keep a food-motivated canine entertained for hours. Not only will they be less depressed, they’ll also be less likely to think about how to get out of the house or yard and you won't have to then go looking for tips on how to find a dog missing if that happens. If you live in a smaller town with a friendly neighborhood where others also have dogs, you can all work similarly to how Neighborhood Watch works. Create a doggy business card, complete with photo of your beloved pet and your cell phone or work number. Share this with your neighbors (and encourage them to share theirs with you). This will help them identify your dog should they ever become lost again and may be able to help detain them or at least contact you to let you know where they were last seen. If your dog hasn't gone missing yet, I highly recommend going through these steps of prevention to ensure that you never need to visit an article on how to find a missing dog after the fact. Next articleHow Much Does a Dog Cost?